Apples, like rhubarb, are a very useful basic wine making ingredient. Combined with a variety of other ingredients they make some excellent wines which could not be obtained any other way. Apples contain pectin and sometimes a little starch. We shall be adding Pektolase as a matter of coarse to destroy the pectin which, as we have seen earlier, prevents wines from clearing. So we are assured of a clear wine, provided starch does not give us a problem here. Starch, as we know, also gives a clearing problem. But in these recipes, as in those for wines from vegetables, we add the sugar in two stages. This is in the hope of inducing the yeast to convert the starch to sugar and ferment it out to leave a brilliant wine. But this plan does not always work. So we wait to see if the wine will clear of its own accord — say a week or two after fermentation has ceased. If the wine is not clear by that time, the use of the starch-destroying enzyme, know as fungal amylase, is justified. 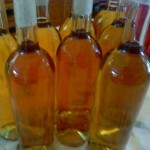 The amount suggested by the manufacturers is 2.5 g per 25 ltr (5 gall) of wine. This amount is represented by one capful of the bottle it is supplied in. If you are treating 5ltr (1 gall) spread the capful on a piece of clean paper and divide it into four. A quarter will be a trifle more than is required but it will do no harm. If you mix the amount with a little of the wine to be treated and thefi stir the sample into the bulk, the wine should be clear in a day or so. 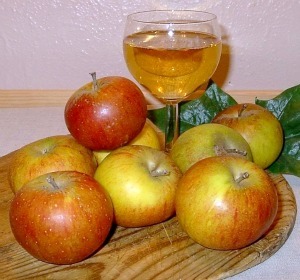 Apple wines are always best if two or three varieties are used and this should include a few cooking apples. The following recipe and method for apple wine will make an excellent wine in its own right, so you may go ahead and make it with confidence. 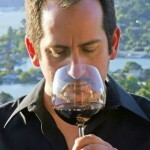 Immediately following the method is a list of vanous fruits that may be added to make a variety of wines still using the basic recipe and method. How to prepare these additional fruits is shown under each fruit and when to add them is shown in the basic method for the apple wine, so everything will be abundantly clear. 4 Check Out These Articles Too! Put 2 ½ ltr (4 pt) of water in the fermenting pail (preferably boiled water that has cooled). 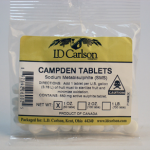 Crush 1 ½ Campden fruit-preserving tablets to a fine powder, dissolve this in about an eggcupful of warm water and stir it into the water in the -fermenting pail. Thoroughly wash the apples but do not peel them. Core them, cut them up and put them through the coarse plate of the mincer (or through a juice extractor, pulper or whatever you may have). Put the juice and pulp into the water at once. This is to prevent enzymes in the apples causing browning. Chop or mince the sultanas and add these to the rest. Put half the sugar in about 6 dl (1 pt) of hot water, bring slowly to the boil, stirring constantly to prevent burning. While boiling, stir into the mixture. Cover closely and allow the mixture to cool (if not cool already) to about 18°C (65°F) — lukewarm. Now is the time to add any of the fruits listed, prepared as advised; merely stir them well in. Having done this, add the yeast and nutrient, cover the vessel with sheet polythene, tie it down tightly with thin strong string (or fit the lid) and keep the mixture in the warm to ferment for eight or nine days stirring daily. The next step is to strain out the solids through three or four thicknesses of muslin. Wring out the pulp as dry as you can, clean the fermenting vessel and return the strained wine to this. Cover as before, while you put the rest of the sugar in about 6 dl (1 pt) of hot water. Bring it slowly to the boil, stirring constantly, and allow to cool well, before stirring it into the wine. Peel the bananas and discard the skins. Mash the bananas with a fork, put them in about a quart of water (use a saucepan larger than seems necessary because they boil up like milk), bring slowly to the boil and simmer gently with the lid on for twenty minutes. Strain while hot to remove the fluffy residue. 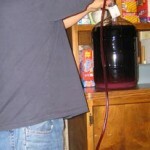 Allow the water to cool and then stir it into the wine. Stir in the Pektolase. 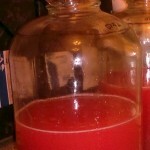 Cover as before and leave to ferment for a further three or four days. Having done this, pour carefully into a 5 ltr (1 gall) jar, leaving as much deposit in the pail as you can. The jar will most likely be full, but if not, fill to where the neck begins with boiled water, then fit a fermentation lock and leave until all fermentation has ceased. If, when pouring the liquid into the jar, there is a little too much to go in, put what is left into a small bottle, plug the neck with cotton wool and add it to the jar when the yeast has used up more of the sugar. It will largely depend on whether you used additional fruit besides the ingredients in the basic recipe whether or not there is more than the jar can hold. If you add any of these, add them when stated in the basic method. 900 g (2 lb): simmer in as little water as possible until they begin to pulp, allow to cool and then add them. 450 g (1 lb): remove stalk, scald them, crush by hand and then add them. As for blackberries loganberries — 900 g (2 lb). Cook in as little water as possible until they begin to pulp. Allow to cool and then add them. 675 g (1 ½ lb): simmer in as little water as possible until they begin to pulp and then allow to cool before adding them. 900 g (2 lb): remove stalks, wash them, scald them, crush them by hand and then stir them in. 675 g (1 ½ lb): simmer in as little water as possible until they begin to pulp. Allow to cool and then stir them in. 450 g (1 lb): soak overnight. Bring to boil and simmer until cooked and in any case long enough to drive off excess water. Allow to cool, break up with a fork and then add them. Note If you prefer, or if you are not close to wild or garden fruit, you may use tinned fruits instead of the fresh fruit as given. Not all of them are found in tins so you will be limited if you cannot obtain others from the countryside. You may use a bottle of Ribena or other blackcurrant syrup instead of blackcurrants, but do not use blackcurrant cordial.